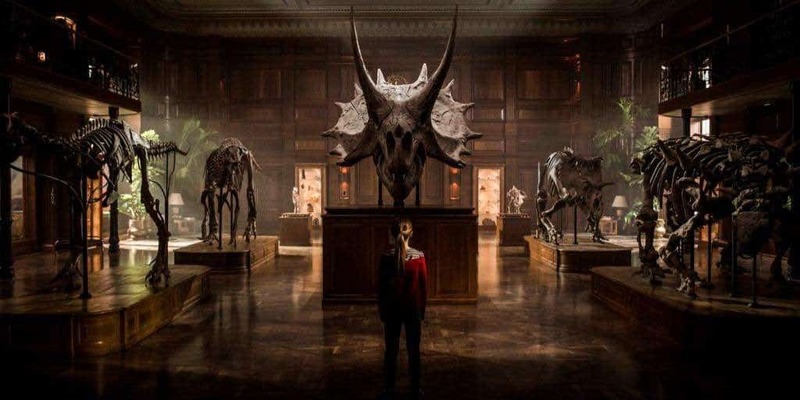 Jurassic World 2's First Image Hits | Nerd Much? Jurassic World 2 (to release June 22, 2018) has only just begun filming and director J.A. Bayona has already tweeted the first official image for the movie. It looks more like a promotional image than an actual shot from the film, but, nonetheless, it evokes a kind of awe. A young girl, wearing a ponytail and a red hoodie, stands before a museum’s display of five different dinosaurs. The director has not mentioned who the little girl is, and so the returning cast of Bryce Dallas Howard (as Claire) and Chris Pratt (as Owen) are our only clues. After their romance in the first movie, perhaps that went further after the traumatic events and the little girl is their daughter. Honestly, it reminds me of this completely unfounded fear I had as a kid. After watching the first Jurassic Park, I went to a famous dinosaur museum, the Royal Tyrell Museum, and I couldn’t shake the fear that these giant sculptures were going to suddenly come to life. I remember staring at the T-Rex, and thinking that its teeth were nearly as long as my arm. Perhaps this little girl is thinking the same thing about the Triceratops? I remember staring at the T-Rex, and thinking that its teeth were nearly as long as my arm. Perhaps this little girl is thinking something similar about the Triceratops? Who knows, and who knows what a museum is doing in a movie about live dinosaurs. Still, I’m confident that producer and screenwriter Colin Trevorrow knows what he’s doing; he has said that Jurassic World 2 will “be more suspenseful and scary” and will have a lot less to do with militarized dinosaurs than the last film. What does the image remind you of? What do you hope its place is in the movie? Let us know in the comments below!